Here at Vertar we are dedicated in bringing to you the widest choice of indoor and outdoor car covers. Whether you are seeking a tailor made or universal car cover, breathable or waterproof car covers, with companies such as Covercraft with heritage now in excess over 40 Years, whatever your budget you will find the right cover for you. Using our help guide you can learn quickly and easily about the differences in the fabrics, the features and how they will benefit you and your vehicle. Vertar also offer tailor made or model specific car covers. Simply choose from the three categories listed below - indoor use, outdoor and Porsche car covers, click and scroll down the list of available car covers to find the cover that best suits your preference. Fits all models of the 968 inc. bridge spoiler Club Sport. It’s also very soft and durable, and with its close fit won’t move about in even strong winds, thereby preventing scratching and marring. Its waterproof middle layer membrane will not degrade in bright sunlight, though continued bright sunlight may gradually fade the outer layer of the cover in parts. The fabric is similar to neoprene, wetsuit fabric with around 6" of stretch so will hug your car, looking great and also keeping it on the car with a pair of underbody clip-in straps. The cover fits around standard spoilers but not GT2/3 models. If you want a quality off the shelf indoor cover for your Porsche Cayenne this is the one. It is made only for the Cayenne so is tailored to fit and drape to flatter the curves of your car. If you want a quality off the shelf indoor cover for your Porsche 996 this is the one. It is made only for the 996 so is tailored to fit and drape to flatter the curves of your car. They are made for us in England from a soft, breathable 'peach' feel fabric in 5 colours. Each cover has been made on a NARROW BODY 996 to fit well, outside the mirrors. If you require a wide body version please call to order until we have it listed here. If you want a quality custom made indoor cover for your Porsche 944 this is the one. It is made only for the 944 (2.5, 2.7, S2 and Turbo, rubber or bridge spoiler) and is tailored to fit and drape to flatter the curves of your car. They are made for us in England from a soft, breathable 'peach' feel fabric in 5 colours - black, red, silver-grey, dark blue, light blue. Each cover has been made on a 944 Turbo (bridge spoiler model) to fit well, outside the mirrors. If you require a different version eg Lux, rubber spoiler please call to order. Mainly for use indoors, they are breathable and light shower resistant so can be used occasionally outdoors too. Add 2 underbody clip-in straps at £16.99 if you wish to use it outdoors. If you want a quality off the shelf indoor cover for your Porsche Boxster this is the one. It is made only for the Boxster so is tailored to fit and drape to flatter the curves of your car. They are made for us in England from a soft, breathable 'peach' feel fabric in 4 colours. Each cover is made on the Porsche car listed, to fit well, outside the mirrors. If you want a quality off the shelf indoor soft breathable cover for your Porsche 911 (997 model) this is the one. This cover is made for the 997 (standard narrow-bodied cars) - we will add listings for wide bodied cars and other models such as 993 and 996 (for which we already have patterns). These covers are tailored to fit and drape to flatter the curves of your car. We have the 997 GT3 pattern too, which is telephone order only at £170. Other 911 versions to follow. All orders will be assumed to be narrow bodies unless specified until we increase web purchasing options. As any Porsche owner knows, there are many versions to list - around 25 of the 997 in the end ! They are made for us in England from a soft, breathable 'peach' feel fabric in 6 colours - black, red, navy blue, royal blue, silver-grey and dark green. Each cover is made on the Porsche car listed, to fit well, outside the mirrors. They are elasticated at each end and will cover all the paintwork. Mainly for use indoors, they are breathable and light shower resistant so can be used occasionally outdoors too. 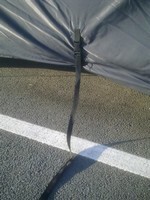 If you plan to use it outdoors, please request 2 clip in underbody straps at £16.99 per set.